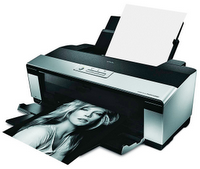 In the next month I will be bringing you a definitive review of the Epson Stylus Photo R2880 printer. This is a little different for me, as the R2880 is of great interest for more than one reason. My passion for photography will marry up to this product well, if it delivers on its promises. It uses Epson UltraChrome K3 inks with vivid magenta, which should produce some stunning photo prints. Also on board are three blacks, a standard one, a light black and a light light black, so fine art prints should look really fantastic. Epson quotes "UltraChrome K3 ink has improved print permanence characteristics that provide lightfastness ratings of up to 108 years for color and over 200 years for black and white under rigorous industry accepted display conditions*. With its expanded color gamut and breakthrough 8-color system, no other ink set can reproduce the three dimensional lifelike quality and stunning photographic feel of Epson UltraChrome K3." In addition to the printer review, I will also be testing some Epson papers, as well as third party offerings from Hahnemühle and hopefully Permajet. These will be very interesting to see just how much detail and accuracy I can get out of the R2880. Keep your eyes peeled for this review around mid-May.